Kids! They are such a problem ! All moms and papas love them so and would also love to knock them in the head. This happens in real life and also guess what, here in SL. I have talked to many and spent time with them having fun .. Riding, rafting .. dancing .. fishing ... I have spent some special times with kids fishing in contests and laughing so hard at their wit! They knock my socks off! Some are kids just to be kids. Some are reliving a time of their life that they really enjoyed and felt loved and safe. Some are living a life they never had when they should have had it. Imagine! Isn‘t that why we are all here, hoping for something we don’t have or can’t have in real life? How many times have I heard “Why would anyone want to be a **** ?“ Replace that with anything you want, furry , vampire, tiny, greenie, slayer of zombies, model, stripper. Some people think that the kids may be perverts. Forget it!! Perverts are not masquerading here as children. Some might try, but if they were they would be reported immediately by the KIDS! Also if a pervert does approach one of these SL kids they are reported immediately! There are SL kid websites and groups that watch and advise. 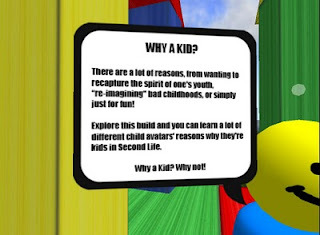 These kids want to enjoy this virtual life and have lots of fun doing it. Some are master builders and scripters. Some own sims full of furniture for sale, some have malls, some design clothing. I have seen some very weird avatars around in SL and I figure they must be that avatar because they want to for some reason. Live and let live. Enjoy what we have while we have it! If you really would like to hear why a person chooses to be a kid now is your chance! You can do it easily without asking any kid. Visit the sweet build by Marianne McCann at the SL7B. 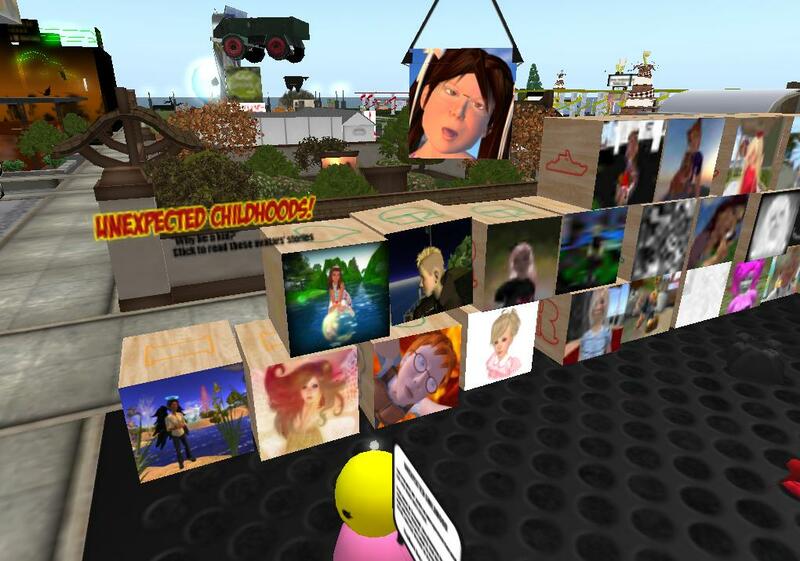 There are toy blocks with the pictures of kid avatars. Click any block and you will pick up a note card that will tell you the personal view of why that person chose to become a SL kid. The SL Kids Exhibit in SL7B is in the SL7B Visionary sim at (205, 184, 22). I've just downloaded iStripper, and now I enjoy having the best virtual strippers on my desktop.